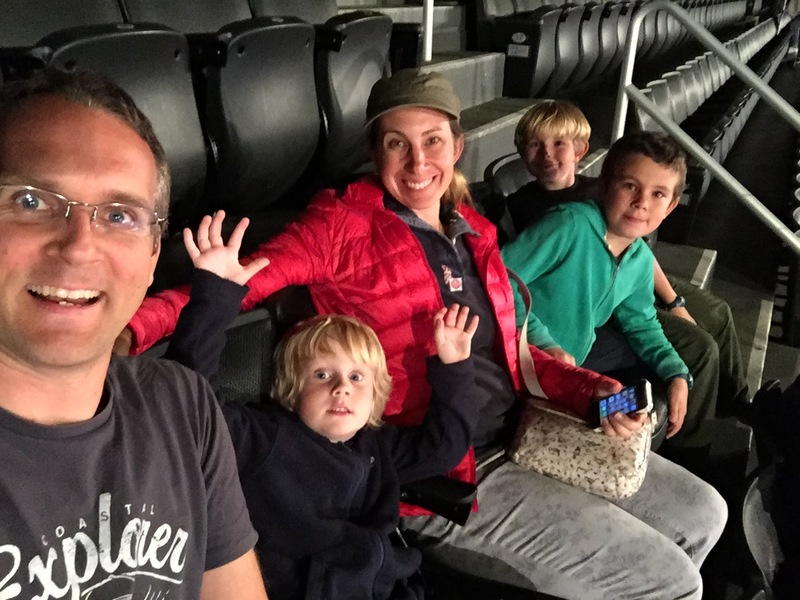 After a bit of shopping first thing, our plan was to walk to the Intrepid Sea, Air and Space Museum for the afternoon before heading across to Times Square – all in all, a good 5 miles of walking for the day. We noticed a number of pedestrians heading towards a staircase and, like any conscientious Brit, we found ourselves drawn to the back of the line. Inspired by the Promenade Plantée in Paris, the High Line is an old section of elevated railway line on the lower west side of Manhattan which has been turned into a public walkway. Sculptures, murals and other works of art are scattered throughout and the borders have been landscaped with local plants, many of which self seeded in the tracks once the freight line was no longer used. It’s a great way to view the city, without worrying about crossing roads or stopping for cyclists and a brilliant example of regeneration: Old highrise buildings that overlook the High Line are being transformed into desirable apartments and views which were once considered an eyesore now come at a premium. 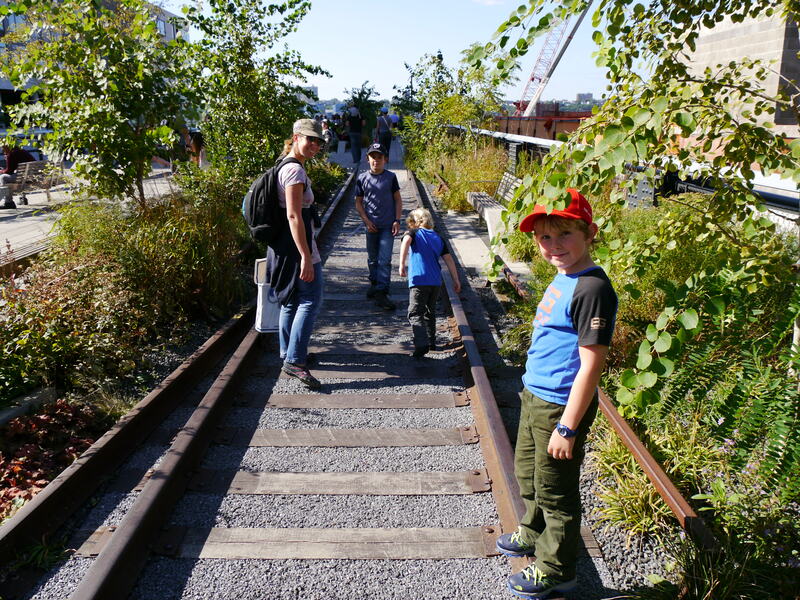 We took the High Line from the Meat Packing district in the south almost the entire length up to West 34th Street, just a few blocks from the USS Intrepid and, because there was always something to look at, the boys didn’t moan too much about the walk. Docked at Pier 86 on the Hudson River, the USS Intrepid is host to the Space Shuttle Enterprise, together with dozens of aircraft from all over the world. A British Airways Concorde sits on the pier itself and on the other side of the pier you can explore the guided missile submarine Growler. It sounds ridiculous but this being the second space shuttle and Concorde in as many months, I was more interested in the submarine. Operational from the late 1950s to mid 1960s, Growler’s role was to provide nuclear deterrent off the Soviet Pacific coast during the Cold War. 78 crew and 9 officers were at sea for up to two months at a time, sleeping in triple bunks that make Japanese capsule hotels seem spacious. 9 crew even slept in the torpedo rooms. Each crew member had a space about the size of two shoe boxes for all of their clothing and personal belongings; and to think that we struggled with 5 cases and 5 backpacks! Back on Intrepid we learned that Enterprise, the first Space Shuttle, was originally planned to be called Constitution. However, following a successful campaign by Star Trek fans she was renamed Enterprise, with Gene Roddenberry and many original cast members attending the roll out ceremony. Enterprise was the test shuttle, built without engines, so sadly incapable of space flight but still incredible to see. She appears in pristine condition on the Intrepid and no doubt inspires young, would-be astronauts everyday. 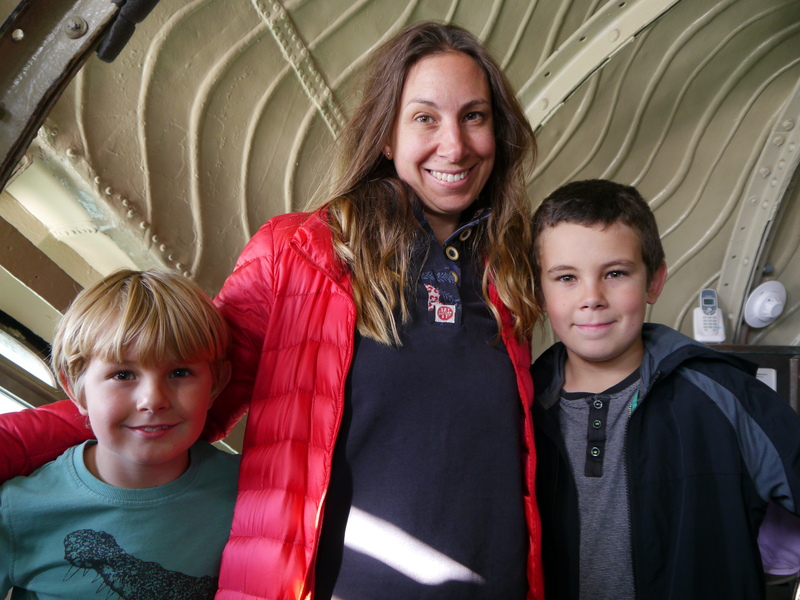 Down in Intrepid’s Hangar Deck the Exploreum is an interactive exhibition where kids can steer aircraft and climb into a real helicopter. 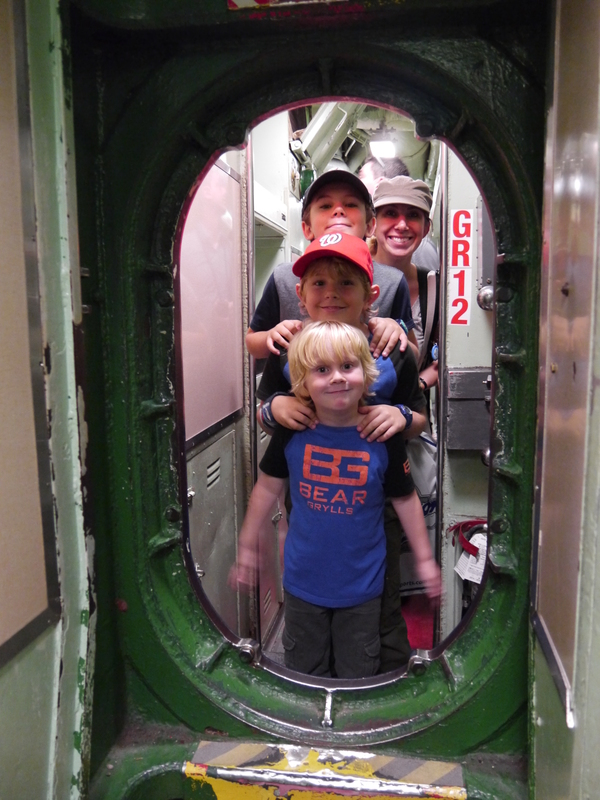 They can try out submarine bunks for themselves and experience the claustrophobia of the mess rooms. 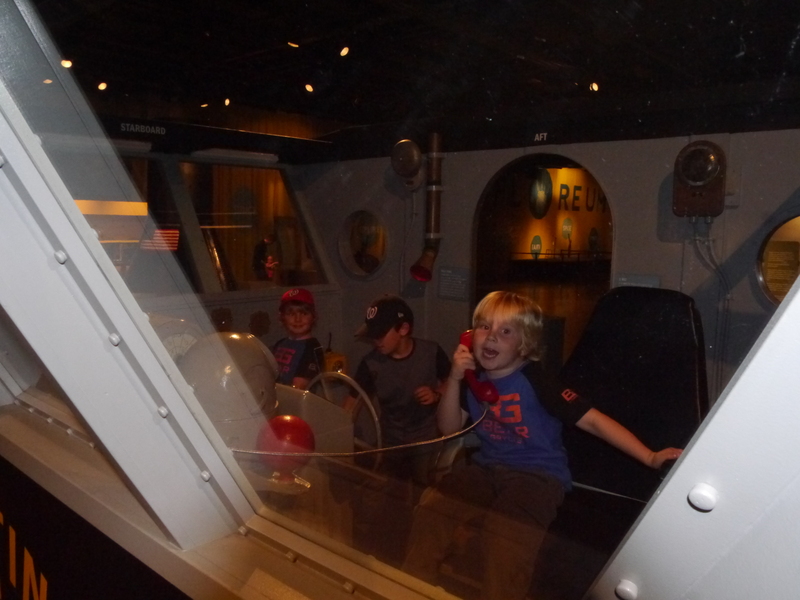 Our boys had a great time and this was definitely one of the most memorable museums we have visited. As the sun went down we made our way to Times Square, despite all the warnings from the guidebooks and tourist websites. As usual, it was utterly rammed with thousands of people milling around staring at the neon billboards and flashing adverts and, in truth, it was just as hideous as the reviews suggested – the sort of place you go once, snap a few photos and then never return to. The kids were hungry and since we couldn’t bring ourselves to join the queues for hot dogs, we (incorrectly) assumed that McDonalds might be quicker. My goodness, the staff here seemed to barely have time to breathe. It reminded me of working on a market stall in the run up to Christmas – you start at 6am and the next time you look at your watch it is 4 in the afternoon and you realise you haven’t eaten all day. Upstairs we found an assortment of cartoon characters, headless, as they tucked in to their cheeseburger meals before having to resume their cheerful demeanour, seeking tips for cell phone snaps. Even in October the heat inside one of those foam heads must be unpleasant, but there was something slightly depressing about the sight of a sweaty bloke with Super Mario’s body sharing fries with a headless Minnie Mouse; I half expected them to light a couple of cigarettes. Earlier in the week I had put my internet browsing skills to the test and secured (relatively) cheap tickets for Matilda on Broadway. We have a number of Roald Dahl audio books and the story of Matilda is well known to the boys so we hoped they would enjoy Broadway’s musical interpretation. The set changes were mind blowing; desks appeared out of the ground; the Wormwood’s front room turned seamlessly into a ballroom; Matilda’s bedroom became a circus big top and not once did it seem clunky or intrusive. Christopher Sieber stole the show with a sensational performance as the Trunchbull; hilarious, hideous and mesmerizing all at once. The kids did a great job but when Sieber was on stage it was hard to see anyone else. We all laughed so hard and went home buzzing. In the understated words of our 10 year old: “I thought it was pretty good!” – praise indeed – it doesn’t come any higher than that from our John! With glorious warm weather and clear blue skies, the only thing to do today was spend it out in the open so we headed to Central Park to see what all the fuss is about. From our apartment in Brooklyn this was a good 45 minutes by subway. The thing about the New York metro is that it is incredibly good value if you are going any distance; a one way fare is just $2.75 – no matter how how far you are going. And because your destination makes no difference to the price you pay, there is no need for turnstiles at the exit, which is a tremendously good thing when you are travelling with young kids. Not only does it save time but it means that rather than having to search for all the tickets at the exit and push them through the barriers, your hands are free to keep hold of the little people who might otherwise easily be swallowed up in the crowds. Even better; kids under 44″ travel for free. So for less than the price of a couple of drinks we made our way to Central Park for the day. 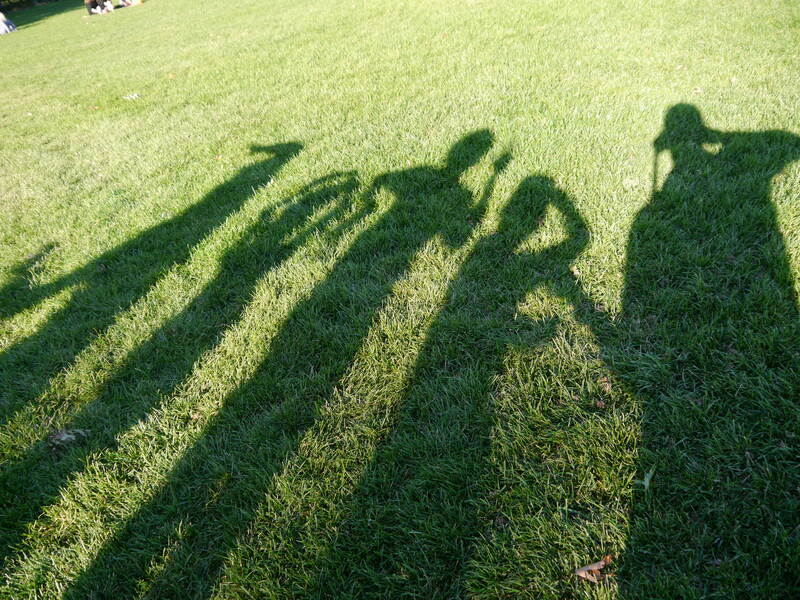 Starting on the west side, we wound our way towards the Great Lawn via several playgrounds. Lots of school groups were using the park for various activities but there was plenty of space and the boys charged around climbing rocks and running down hills until they’d had their fill. 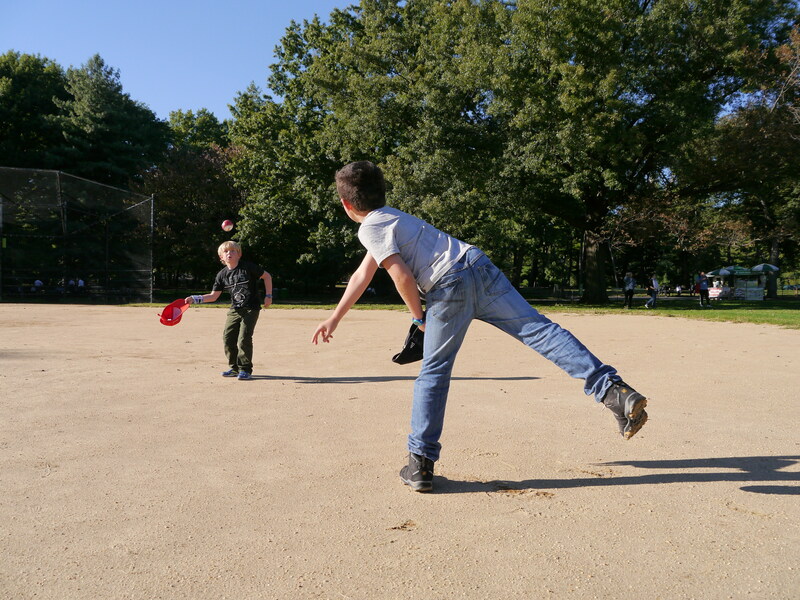 Once at the Great Lawn, the boys found a baseball diamond where they practised their pitching skills whilst I dozed in the sunshine. If people watching were a sport, this would be the place to train. From behind my shades I watched local office workers sharing lunch and young couples falling asleep curled up together in the sun. One couple, oblivious to the outside world, inadvertently wandered into the path of a woman reading with a small dog on her lap. The pampered pooch transformed into a snarling schnauzer, bearing his teeth and giving the poor couple quite a fright. All around, students practised martial arts and parents rocked babies to sleep in buggies or slings. Everyday life in the park. 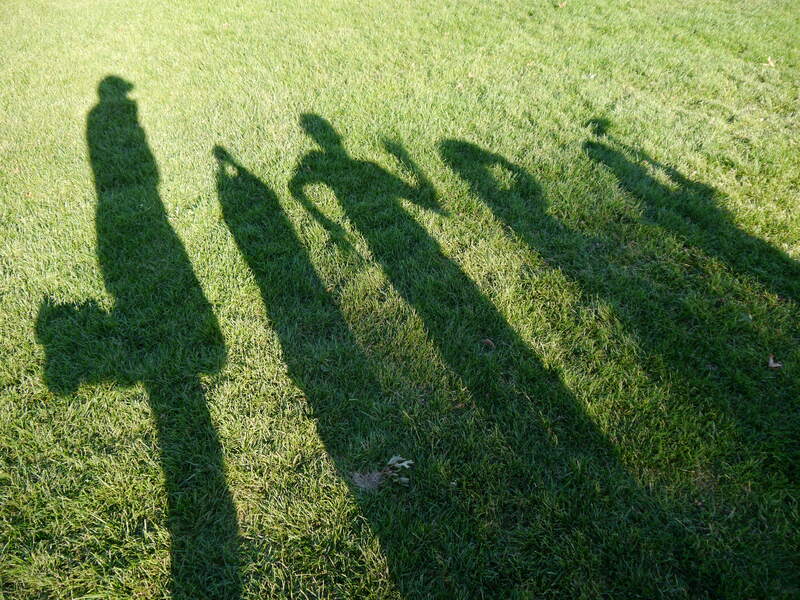 When the boys had played enough baseball we moved on and with the sun behind us we tried to spell out our name with our shadows. It was pitiful really and probably quite a spectacle for any other people watchers in the vicinity – we must have had a dozen attempts before we gave up – each of us could produce a perfect letter but not once did we get them all lined up at the same time. Back in March Nick and I were trying to work out whether it would be better to pre-book some of our accommodation and experiences or to go with a more flexible approach and book things as we went along. It’s a difficult call because there are some things that you cannot do on the fly – if you haven’t booked them months in advance then they will have sold out long before you arrive. On the other hand, if you do commit to being in a certain place at a certain time it is much more difficult to extend your stay in places you might be enjoying. The iconic Statue of Liberty is visited by over 4 million people a year and of those, just 240 per day are permitted to climb up to the inside of her crown so, understandably, the tickets sell out fast. You can pre-book up to a year in advance but you need to be sure exactly who will be visiting and when because the tickets are sold named and photographic ID is required when the tickets are used, to prevent ticket re-sales and potentially very lucrative black market sales. We gave it some thought and decided that, since we had the opportunity, we would book. Alex is not tall enough to be allowed inside the crown and we didn’t fancy any meltdowns on the way up the narrow, spiral staircase so one of us would have to stay behind at the pedestal level; happily Nick did the noble thing. Or did he? There are 354 steps to the crown – that’s the equivalent of 20 stories and, out of breath, red in the face and with legs burning by the halfway point, “noble” wasn’t how I was describing him at the time. Once at the top, however, all that was forgotten. The Park Ranger inside the crown (I think they let him out for meals and once a week on Sundays) was able to spend time telling us about how the statue was made and how Alexandre Gustav Eiffel’s frame was designed to sway to prevent breakages in high winds. Many people can feel the sway from the crown, but I couldn’t be sure on account of the aforementioned 20 stories my legs had just carried me. With clear blue skies the views were incredible and I know the experience is one that John and Teddy will remember for the rest of their lives. After lunch on Liberty Island we caught the ferry back and walked across to the 9/11 Memorial Plaza. This gave us a chance to talk to the boys about what happened and the thousands of people who were killed. 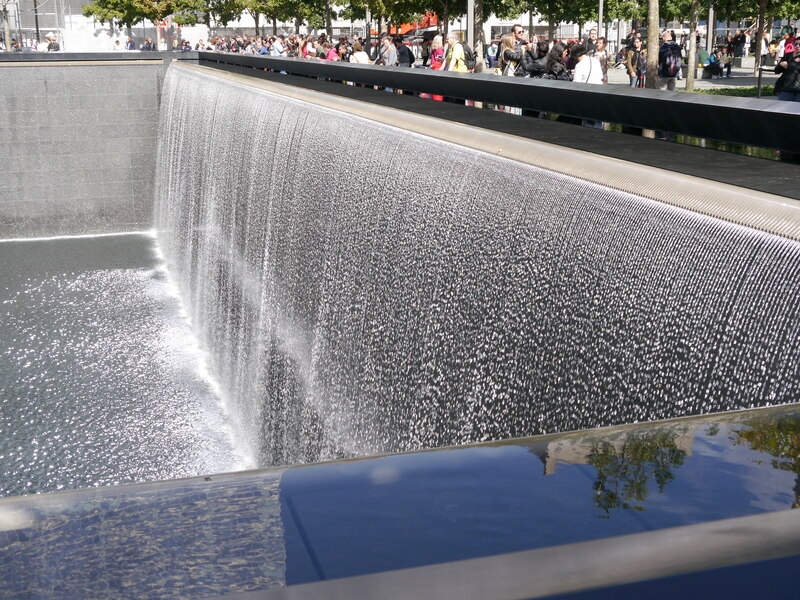 Twin reflecting pools sit deep within the footprints of the original towers and at nearly an acre each in size they are an extraordinarily powerful representation of the scale of loss. The new One World Trade Center, at 104 stories, rises up defiantly on the northwest corner of the site, giving visitors a further sense of the sheer scale of the original towers. Around each pool the names of all those who perished in the attacks, including all the first responders, are cut into the bronze edging plate. 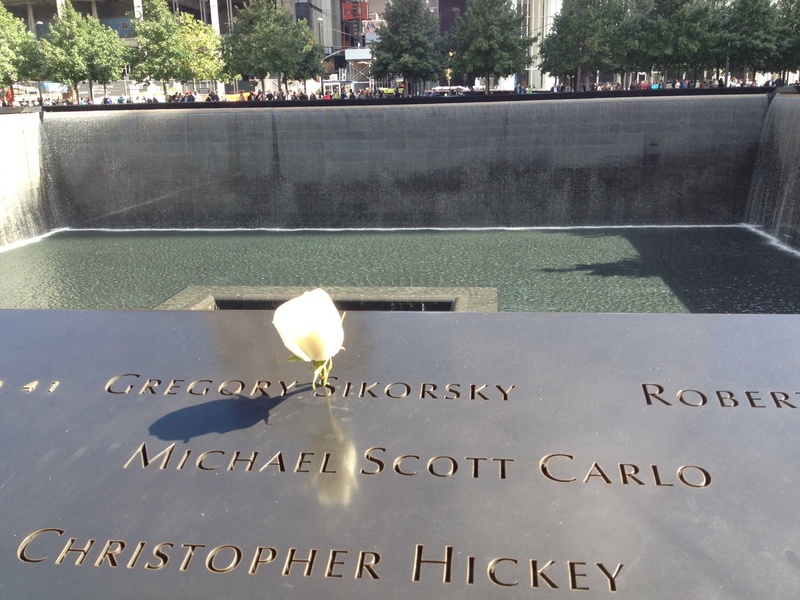 Members of the public are encouraged to touch the names and some leave flowers; the atmosphere is reflective, peaceful and tremendously moving. From here we headed towards Wall Street to look at the Charging Bull. 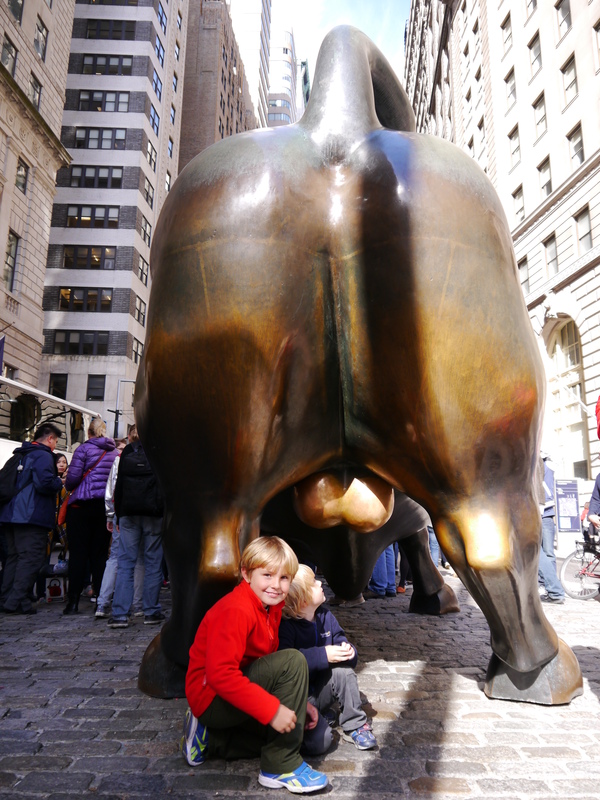 Nick and John discussed how shares are traded, whilst Teddy and Alex were more interested in the anatomically correct nature of the bronze bovine. Bored with queuing for a photo at the head end, my boys were far more entertained by the rear… A quick Starbucks in the grounds of Trinity Church (again of National Treasure fame – “Heere at the Wall” at the junction of Broadway and Wall Street) and it was time to head back to Brooklyn ready to see the Nets at the Barclays Center taking on Fenerbahce Ulker Istanbul – the only Turkish team to have beaten an NBA side. Basketball makes only slightly more sense to me than baseball. I struggle with the number of breaks in the game which seem to interrupt the flow and involve a conflab with the entire team, all training staff, coaches, medics and some fellow whose job seems to be to give the court a bit of a wash down, all at the most unpredictable times. Honestly, in the final section there were just seconds to go – maybe 7 or 8, and they stopped the game for several minutes with the teams huddled together before playing to the end. The boys seemed to be enjoying themselves so I occupied my time taking selfies and tweeting them to the venue which turned out to be quite productive as our faces flashed up on the big screen in a couple of the breaks – very exciting! It is a sad indictment of my twitter skills that those tweets received more likes, retweets and followers than any tweet before or since. In the end the home side didn’t get the result we were all hoping for and Fenerbahce became the only Turkish team to have beaten 2 NBA teams. Ah well. Fully rested and recharged we spent the day exploring Brooklyn starting with Prospect Park. Designed by the same duo responsible for Central Park on Manhattan, Prospect Park is quieter but equally as beautiful. At 585 acres there is too much to see in one day so we concentrated on the east side, down to the Boathouse where we had lunch. 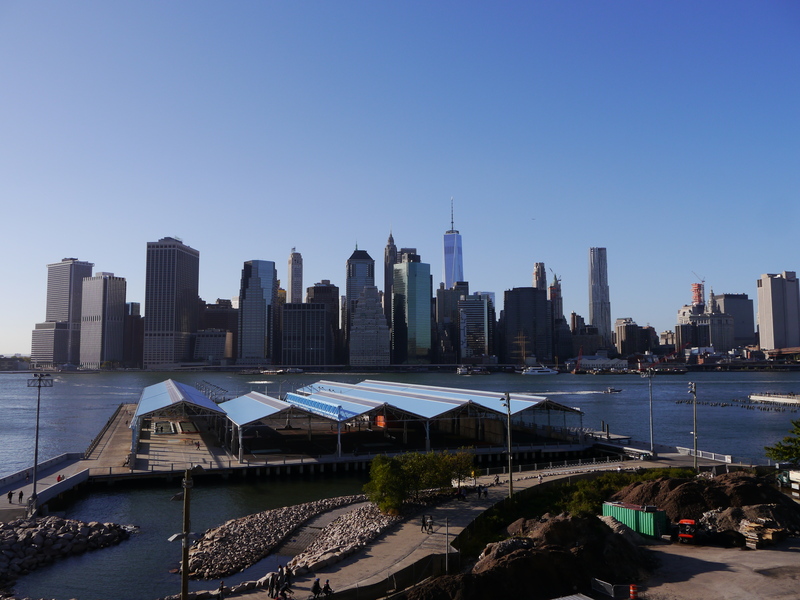 We then stumbled upon Smorgasburg, a local food fayre open every Sunday until mid October. Having just eaten, the kids weren’t interested in checking out the produce, so reluctantly we continued on to the nearest playground to let them burn off some energy. 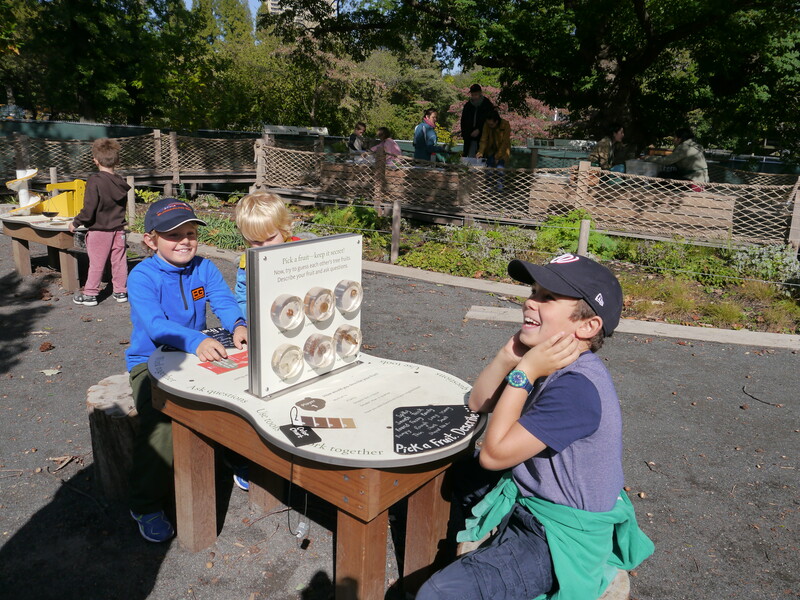 Over the road is the Brooklyn Botanic Gardens, a suggestion which was met with more than one objection from the kids but nevertheless we cajoled them in (Nick was still sore about the food fayre). From the outside, the gardens look modest in scale but once inside they open up like the tardis. Within minutes the kids were in the Discovery Garden playing “guess the fruit”, weighing seeds and learning how birds build their nests. Alex enjoyed pond dipping although it was fairly terrifying to watch as, more than once, he looked like he might fall in and without a spare set of clothes to hand, nor laundry facilities at the apartment, well, it would not have been pleasant. Somehow though he remained upright and we moved on to the Japanese Hill Garden which was spectacular. Although cooler than it had been, the weather was still very bright and clear, showcasing the vibrant Torii over the pond. 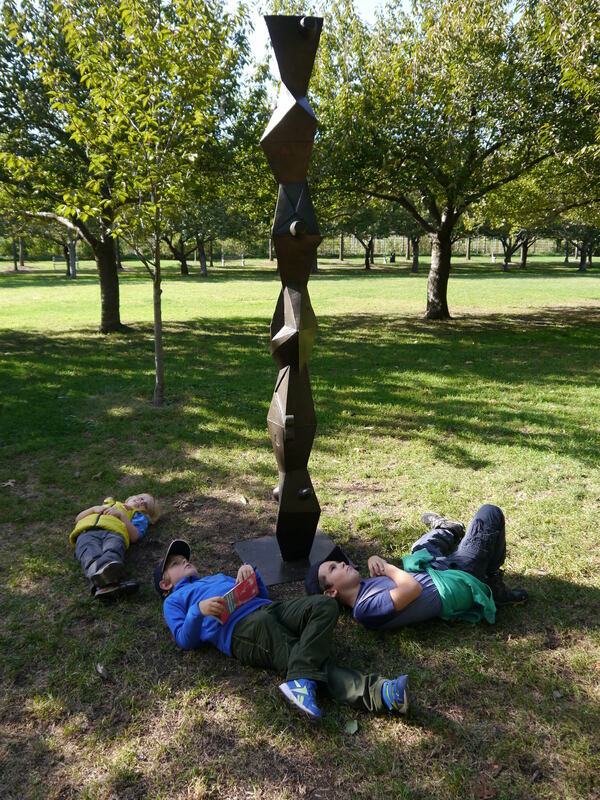 The Botanic Gardens are presenting a selection of Isamu Noguchi sculptures throughout the grounds until mid December this year. The older boys used the excellent Kids’ Discovery Guide to learn about some of the work. As well as suggestions for changing the angle of viewing for the pieces, the guide encourages readers to think about the materials used and their different appearance as the seasons change. As a total novice when it comes to this form of art appreciation, I learnt a lot – never mind the boys! In the meantime, Alex was busy with his Kids’ Field Journal – a sort of I-spy for the most common insects and trees in the park. 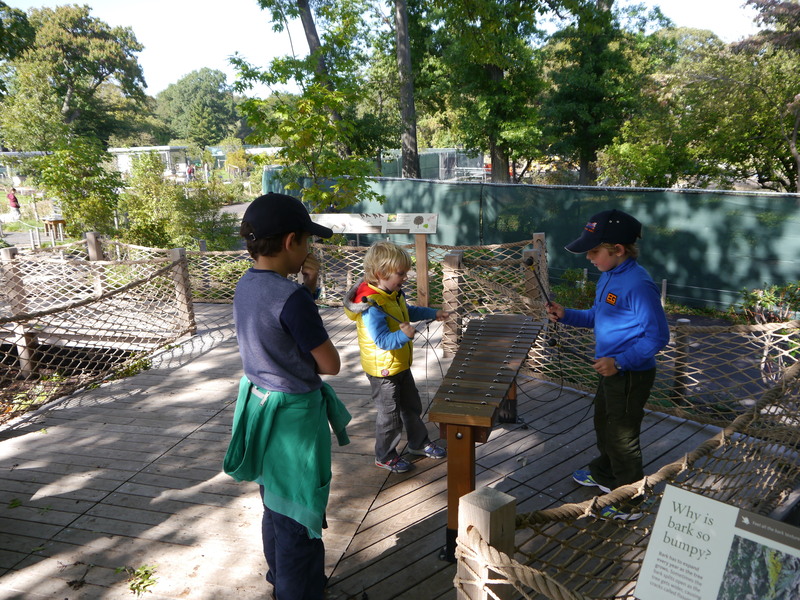 The Botanic Gardens far exceeded all our expectations and we could easily have spent many more hours enjoying them but by late afternoon we were keen to get over to Brooklyn Heights for our first view of Manhattan. Before arriving in New York I asked the boys what they expected the city to be like; their answer described Times Square and the Manhattan Skyline so it was eye opening for them to start with the parks and gardens but now it was time for that famous Manhattan vista. Having been on the go almost non stop for 11 days we needed a day of doing nothing which is exactly what we did on day 12 – we didn’t even get dressed until the middle of the afternoon. The boys caught up on their journals and relaxed with their gadgets, I updated the blog whilst Nick culled the first thousand photographs and, aside from a quick walk around the block, we didn’t go out. This therefore gives me an opportunity to say a bit more about our experiences of Airbnb so far. At the time of writing, we have used Airbnb in 6 locations and all of them have been positive experiences. In Washington DC we stayed in Marcia’s place in Q Street Northeast of the downtown area. Finding cheap accommodation anywhere in the capital is difficult and Marcia’s place was definitely at the top end of our budget but for our first stop we wanted something comfortable to begin with and we weren’t disappointed. The apartment was immaculately clean with a lovely kitchen area, complete with a dishwasher, large stove and fridge freezer and stocked with store cupboard ingredients so that each guest doesn’t have to run out and buy the basics. There were two huge bedrooms each with a lovely full bathroom and all essentials such as shampoo and toothpaste were included. Marcia provides her guests with Metro cards which can be reloaded so that travel on the city subway is discounted as well as a parking permit for those with a car. She came to meet us on our first night and also showed us the discount card for the local supermarket – it’s these little touches that make Airbnb so much better than a hotel. When we left Washington a week later, Marcia found one of Alex’s cars and a hat belonging to Teddy that we had left behind and so she contacted us and kindly posted them on – I’m not sure many hotels would have been so helpful. The only downside for us was that there were no laundry facilities in the apartment or within easy walking distance which wouldn’t have been an issue if we had been going back home after our stay but with many months still ahead we (and of course when I say “we” I mean “Nick”) had to find the local laundromat. So, for anyone considering a trip to Washington DC and looking for a place within walking distance of the main attractions (or just a couple of blocks from the metro), we would wholeheartedly recommend Marcia’s apartment – here. For Philadelphia and New York we tightened our budget a little and stayed in slightly smaller, but perfectly adequate apartments. Both had great access to public transport and on street parking and in all cases we have found communicating with our hosts throughout our stay has been easy and helpful. One of the downsides with Airbnb is that there is a risk that a host will cancel a booking, potentially at the last minute, which with kids, could be very stressful. A month or so before we left Airbnb notified us that the original place we had booked in Philadelphia had been cancelled. This was hugely disappointing but we were offered a contribution towards another Airbnb rental and of course a full refund on the cancelled booking. It took less than 2 hours to find something else that was suitable. I suppose if we had been looking at somewhere really remote with only one Airbnb property for miles around, it might be more significant but generally, in the major cities, there are enough alternatives for the risks of cancellation to be manageable. Our most recent properties have been fantastic: In Braintree our suburban home just outside Boston, our host had stocked the property with everything from hair straighteners to Epsom Bath Salts (which I may have made use of!). When we notified him that the dishwasher was playing up, he immediately swapped it out for a brand new one – on a public holiday! I’m not sure every host would be so quick to act but reading the reviews suggests that many do. What I like about the Airbnb website is that you can set quite specific search parameters to find what you are looking for. So, now that I know what I am doing, I can specify that I want a non smoking, 2 or 3 bedroom place within a specified geographic location, with laundry facilities and even a carbon monoxide detector. I can set an upper or lower limit on the amount I want to spend and I can search with particular dates, or none at all. Joining was very straightforward; I emailed a photo of my driving licence and linked my Facebook account and was set up in under an hour. So, if having read all of this, you fancy giving Airbnb a go (and why wouldn’t you – I’m not sure I’ll ever use a hotel again!) you can click on the following link to join and we will both get a small discount on our next bookings: Click here for your discount. Don’t be shy now – you know you want to! Our final day in Philadelphia started with the usual crazy packing, last minute laundry and cleaning up before we jumped in the car and headed to Adventure Aquarium just over the bridge in New Jersey. Having visited the National Aquarium a few days earlier, this is one of those places we would probably have skipped but for its inclusion on the CityPASS and the fact that it was kind of on our way to New York. In addition, Hurricane Joachin was marching towards us with ferocious winds and sheet rain so there was no chance of any outdoor activities today. 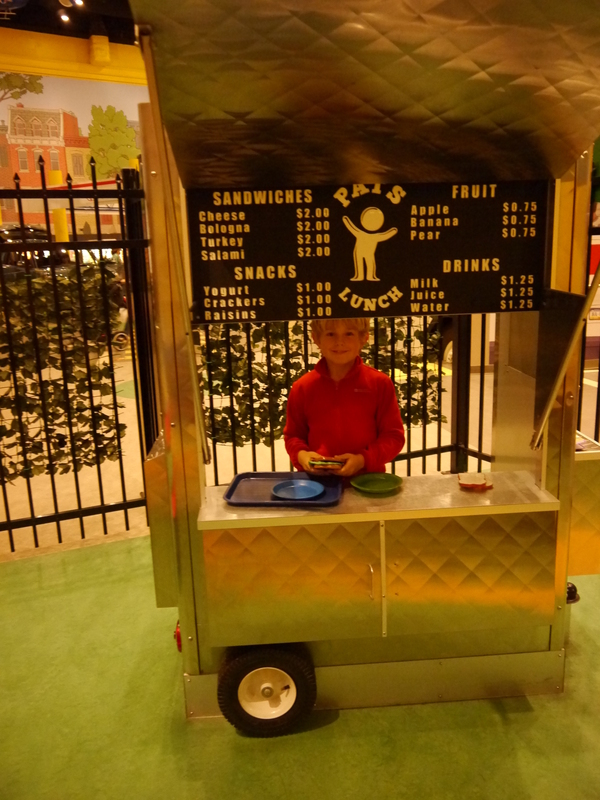 It gave Nick the chance to try the famous Philly Cheesesteak – thinly sliced steak loaded with cheese in a long roll. Despite our apartment being situated between two highly recommended purveyors of Cheesesteak we ran out of time and didn’t get a chance to try them fresh, the way they really ought to be eaten. 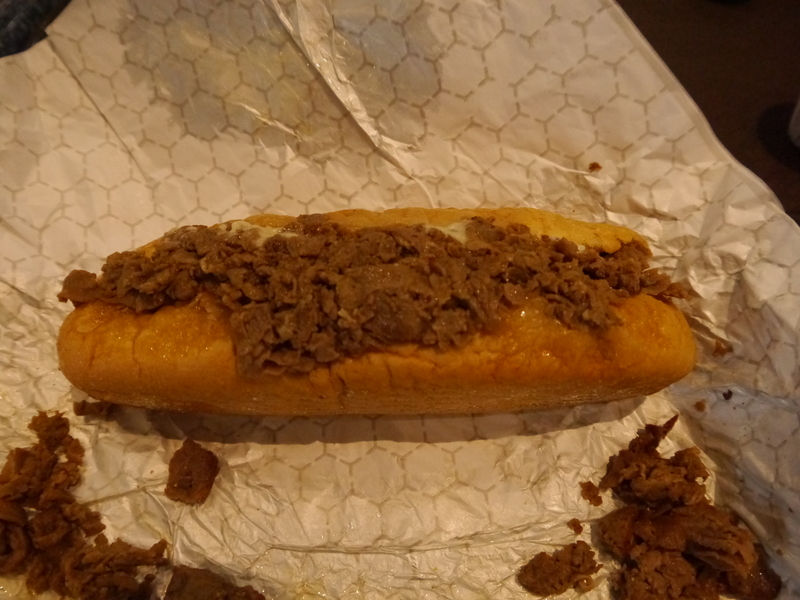 Thus the pre-packed Cheesesteak at the Aquarium probably wasn’t the best first experience of the local delicacy although Nick gave it a generous 7 out of 10. It didn’t look wildly appetising but, given the state of some of the meals I’ve dished up, I know that he isn’t worried about presentation! Nick would be the first to admit that he couldn’t boil an egg, let alone cook a Cheesesteak, so I think he was happy enough. Adventure Aquarium is most famous for two things; the Great Hammerhead Shark and their two Nile hippos, Button and Genny (both are beautiful 3000lb girls who made me wonder what I was worried about, passing on the Cheesesteak!) I’m not sure how I feel about either species being in captivity and, for me, neither were the highlight of our visit. The best part was feeding the rays at Stingray Beach Club. The kids and I were given small, decapitated fish to feed the stingrays with and, since their mouths are on their underside, the way to do that was to hold our hands on the bottom of the pool with fish poking up between our fingers and wait for the rays to swim across. Sounds easy enough. Full credit to John who managed to stay calm and get through both punnets of fish (originally bought for the whole family) without flinching or shrieking, unlike the poor example set by his mother, even when the huge Leopard Whipray passed by with its wing almost to John’s shoulder. 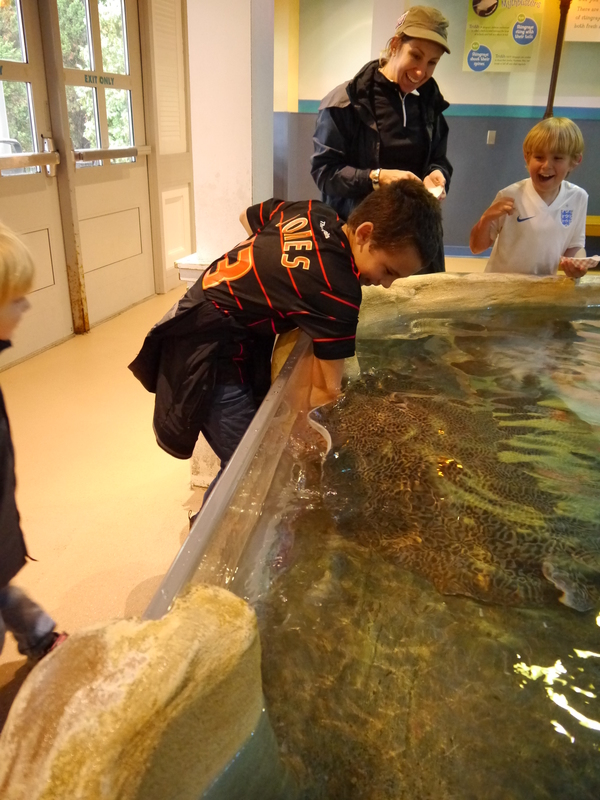 All three boys loved it and as we moved through the aquarium they had the chance to touch sharks, horseshoe crab and various shrimps and starfish. All in all, it was an excellent couple of hours but we needed to keep moving to stay ahead of the hurricane and to stand a chance of reaching New York before rush hour. We made good time and even with a quick stop at Costco in Staten Island for groceries we arrived by 5 and couldn’t believe our luck when we found a parking space right outside our apartment….yeah…so it turns out: You can’t park within 15 feet of a fire hydrant in NYC. 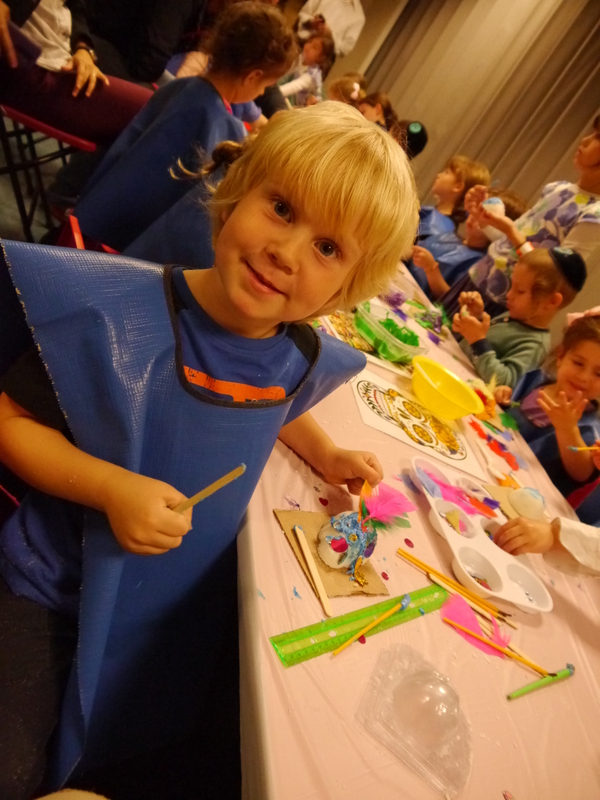 Day 10 – Philadelphia Zoo and the Please Touch Museum. Billed as “America’s First Zoo” with the mission of connecting people with wildlife, Philadelphia Zoo is a relatively small, inner city zoo that does a decent job of presenting animals and their habitats to general public. As a family we have enjoyed many zoos and this one, understandably, feels dated with its 19th century park design. Even so, they are working hard to innovate, for example, with the award winning Zoo360 – a series of animal trails which allow some of the primates and big cats to walk around in aerial mesh tunnels to explore other parts of the zoo. All I could think of to say was “Let’s go and find the tigers.” Alex didn’t move. I looked at Nick for help only to find that he had his hand clamped over his mouth to stifle the laughter as his body shook and the tears ran down his face. I’m limited to 3 T-shirts, but we have to bring a sugar skull. And I’ve still got no idea what it’s for.